by Andy Duncan in the school library where I substitute teach. Of course the title caught my interest. I'm a native Alabamian and love this state, but let's face it. We have our fair share of curiosities. As I'm sure other states do as well. This is the second book Duncan has written about Alabama's Curiosities. You can check out the first here. Duncan shares his lists of interesting town names in Alabama in the introduction along with a few other state quirks. He then divides the curious aspects of our state into five regions: coastal, east central, southeast, north, and west. From the Interstate Mullet Toss (and we're not talking about the 80s hairstyle) at the Flora-Bama to the world's largest office chair in Anniston, Alabama Curiosities is filled with the wonderfully quirky and odd things that make our state what it is. If you haven't RSVP'ed yet, do so here or on the original post! I got a bit behind on getting new blogs on "The List" during the end of my pregnancy, so there are FORTY-FOUR new blogs listed!! Please go welcome our new friends (especially the ones that live near you! ), and check out their blog homes!! I had the privilege of meeting a new Alabama Blogger, Kate Martineau Adams, at our last blogger meet-up. I didn't get to talk to her for very long, but her story and blog focus intrigued me. And, when I had the opportunity to check out her blog, I was hooked! Kate is a new Alabama transplant, moving here from Brooklyn. She loved living in New York City (after all, it IS a fabulous place) until she had kids. And so, to find a more family-friendly place to raise their family, she and her husband moved here - to Birmingham. Of course, the culture is unbelievably different, and so her blog, The Brooklyn Dodger, is all about comparing and contrasting the differences of her life in Brooklyn versus in Birmingham. Her blog is a wonderfully fresh look at our city through the eyes of a new resident, and it thrills my heart to see someone so excited to live in our great city! Her glowing perspective on Birmingham is a needed one in this city, where so many people find so much wrong with it. And, her unique ability to contrast and compare it with life in Brooklyn makes for some fascinating reading! Check Kate's blog out at The Brooklyn Dodger, and follow her on Twitter at @KateDodger. 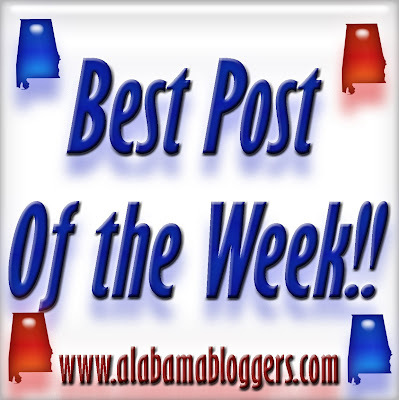 Do you know of an Alabama Blog that should be spotlighted? If so, email me at rachel@alabamabloggers.com. Don't Miss This Blogger Moving Sale of the Century! We are losing one of our kindest, most amazing Alabama bloggers - Rhoda of Southern Hospitality is moving to Georgia in a couple of months, and will be terribly missed around here!! Rhoda is always one of the people I most look forward to seeing at our meet-ups. She has been a HUGE influence on me (more than she knows! ), especially in the graceful and kind way she conducts herself and her blog. Rhoda's blog is based around her amazing decorating skills, and as such, she has some really great stuff. She is having a moving sale this Friday and Saturday in which is is selling a lot of her wonderful finds. She has pictures of some of the things she is selling, as well as instructions on how to get to the sale, in this post. If you're a yard sale person or need some great home accessories or furniture, be sure to go visit Rhoda this weekend! !